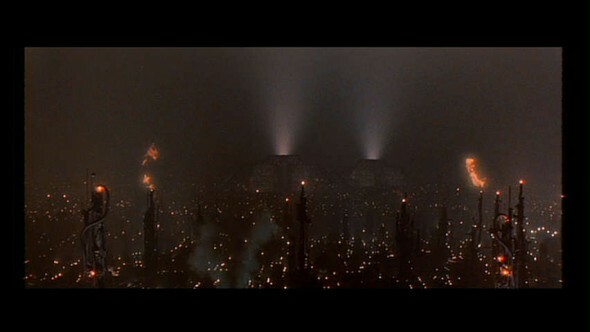 As if secreted from the human species like a concrete hive of ‘progress’, cities – dystopian or utopian – are always present in sci-fi. They are mutually bound, like Dr Pepper and plaque. 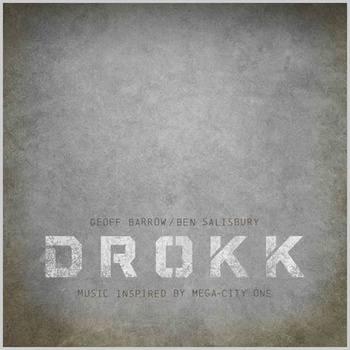 This new album, DROKK, by Geoff Barrow and Ben Salisbury, inspired by the fictional, ‘Mega City One’, from the Judge Dredd comic series – is one part of (what I would call) an entire sub-culture of work inspired by imagined cities – insert my own album (humble brag) here – spanning the last hundred years, at the very least. It’s got everything you expect (and what I, personally want ) from a score of a fictional future – synths, and not much else; drones, fuzz, pulses and endless bleak repetitious themes. On first listen it immediately recounts numerous, obvious (but essential) influences. From Vangelis, Fiedel’s murky electronic score for ‘The Terminator’ (especially on ‘Clone Gunman’), to Carpenter’s ‘The Thing’, score by Morricone (‘Lawmaster/Pursuit’). On second listen, it gets even better. From track 7 the fractious pulses temporarily calm, introducing the slightest hint of the human voice on ‘Exhale’. ‘Dome Horizon’ (which sounds like the title of some kind of Arthur C. Clarke epic) unleashes a beautiful but fleeting moment of optimism before the darkness and adrenaline sets back in to close.